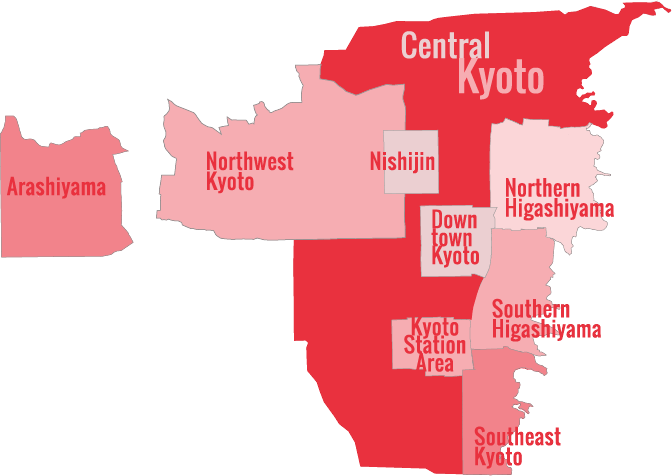 Kyoto is regarded as the birthplace of kabuki drama. If you are fortunate enough to be in Kyoto when a kabuki show is on, you should definitely experience this lively extravaganza of drama, music and colorful spectacle. Michael Lambe introduces this unique dramatic form and describes a visit to a typical show. The curtain rises and immediately the audience bursts into an appreciative round of applause for the beautiful image of Mount Fuji depicted on the backdrop of the stage. 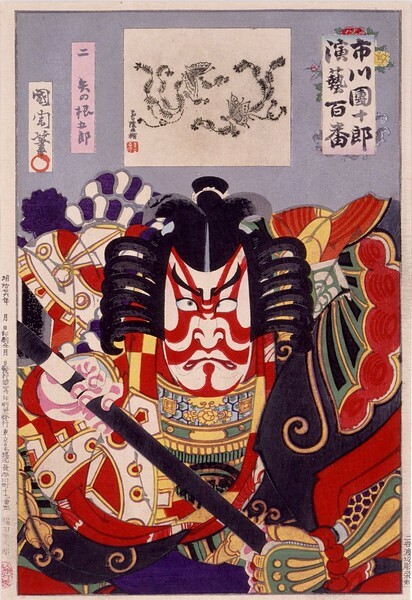 Center stage on a dais is a samurai, wearing oversized armour and exaggerated make-up. He is brandishing an enormous arrow and speaks in a guttural voice that I find all but unintelligible. From his tone though, and his bombastic poses I gather that he is not happy. And his makeup, in vivid lines of white, black and red, suggests nothing if not anger. As he struts and leaps about the stage, members of the audience shout their appreciation. At one point he jumps high in the air and lands – bang! – on his backside! The audience again erupts in applause and cheers – and I with them! This was my very first time to see a kabuki performance and though a lot of what I saw was mysterious to me, I felt very much as if I were a kid at the circus and was fully caught up in the spectacle. To fully appreciate a show though, it helps to do a little research on kabuki in advance so that you know what to look out for. Kabuki is a form of classical Japanese drama known for its spectacular stagecraft, colorful costumes, elaborate make-up, stylized (and often acrobatic) performances and intensely dramatic plots. Tales of conspiracy and revenge, love and seduction, historical conflicts and tragedies are common. However, a typical kabuki show, is so focused on the intensity of the dramatic moment, that rather than depicting an entire story, unrelated excerpts from different stories are performed. When I visited the Minamiza (Kyoto’s main kabuki venue), I saw three such short stories presented in just a little over three hours including intermissions. Most kabuki plays were written in the 17th and 18th centuries and the stories they told were familiar to the audience so they didn’t need to see a presentation of the whole play. However, the antiquity of the plays does mean that a lot of the language used is archaic, and the stylized speech patterns also help to render it difficult for modern audiences to understand. These days, kabuki theaters often rent headsets to theater goers which explain the play in modern Japanese. They sometimes have these in English too, but when I visited the Minamiza theater in Kyoto they only had Japanese headsets available. I had read a little about the stories I was going to see in advance however, and what I didn’t understand my fiancé explained to me in the intermissions. Kabuki was born out of comedic and bawdy entertainments for the common people and has long been the most popular of Japan’s traditional dramatic forms. As such it is an integral part of Japanese culture. Famous ukiyo-e artists such as Katsushika Hokusai and Utagawa Toyokuni III often depicted scenes from kabuki in their woodblock prints. 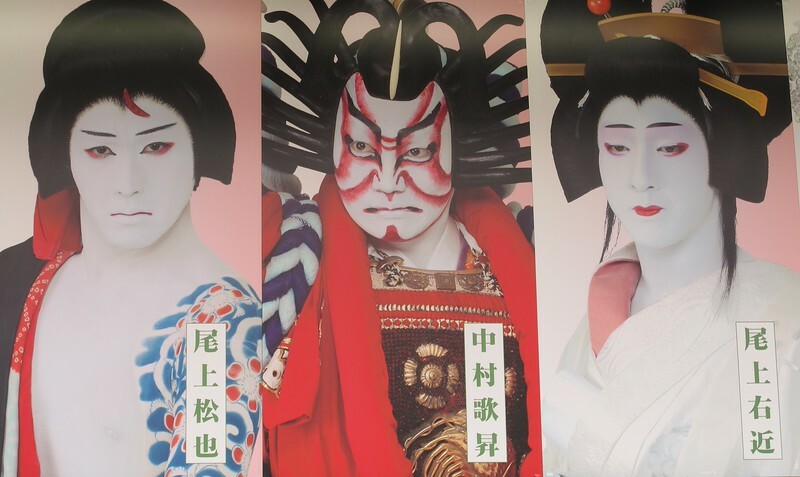 Today many kabuki actors are treated like idols and also appear in TV dramas or popular Japanese movies. One major oddity of kabuki theater however, is that all the roles, regardless of gender, are played by men. This wasn’t always the case though, so how did it come about? 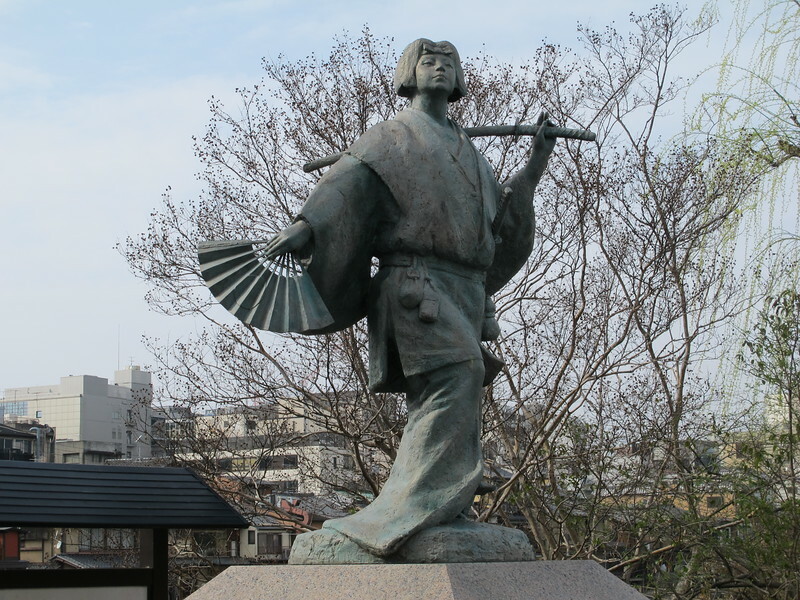 On the north-eastern side of Shijo Bridge in Kyoto, there is a statue of a woman. In one hand she holds a fan and the other bears a sword which she has rather casually slung over her shoulder. This is Izumo no Okuni, the founder of kabuki theater. Okuni was originally a shrine maiden at Izumo Shrine in modern day Shimane prefecture. Here she would have learned the traditional ceremonial dances and songs of the Shinto religion. Around 1603 however, she was sent to Kyoto, presumably to earn money for the shrine with her performances. Okuni quickly established herself however, as an independent artist of a unique new theatrical form. 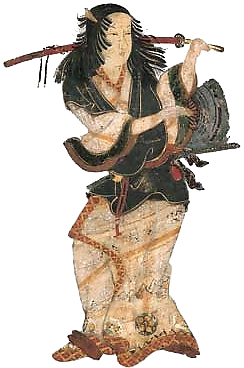 On the dry river bed of the Kamogawa river, close by Shijo Bridge, Okuni gathered a troupe of female performers and entertained the crowds with sensual dances, and risqué cross-dressing comedies. Her own most popular role was that of a samurai who is seduced by a teahouse prostitute. It was a daring and eccentric new entertainment, and was quickly dubbed “kabuki”. Today the word kabuki is written with the Chinese characters for “song”, “dance” and “skill”, but originally the word meant to behave and dress strangely. In any event, it was a huge hit among all classes, and Okuni was even asked to perform before the emperor. Many of Okuni’s original performers were in fact prostitutes who used the shows to advertise themselves to prospective customers. This ribald aspect of the show continued with other all-female troupes, and often led to disorder in the theaters as jealous theater goers got overexcited and came to blows. In 1629, to put a stop to these disturbances, the authorities banned all female kabuki troupes entirely, and troupes of young boys took over the roles instead. Unfortunately however, the boys aroused as much excitement as the women, prostitution continued and violent brawls broke out again. In 1652, performances by boys were also banned and adult men took over the roles. This was when kabuki as we know it was born. 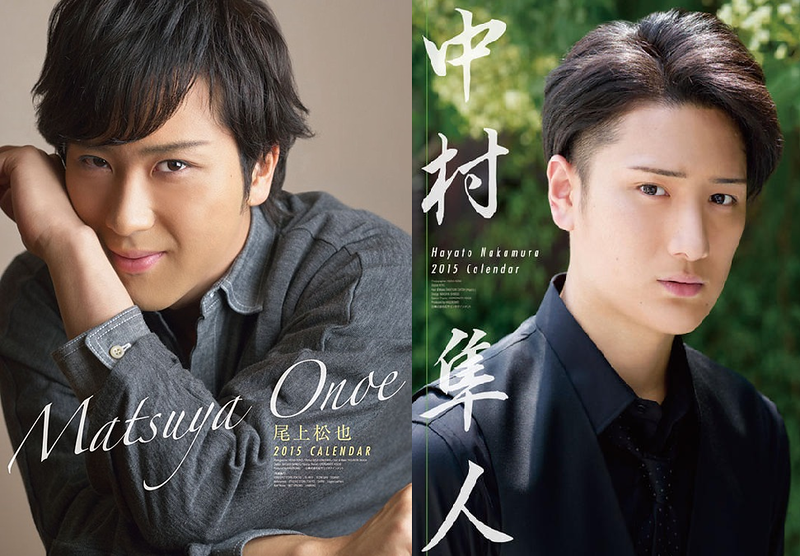 The male actors who still play female roles today, are called “onnagata”, and the artistry they employ to appear more feminine is believed to be so refined that genuinely female performers could not compete with them! The “hanamichi”, literally a “flower path”, is a walkway from the stage that projects out into the audience. This is used for dramatic exits and entrances, but also some dramatic scenes are played out here. The close proximity of audience and actors adds to the immediacy and excitement of the performance. Shouting from the audience. At moments of dramatic tension, as an actor strikes a pose, some audience members will call out the actor’s family name in appreciation. Kabuki actors belong to long theatrical dynasties that have used the same stage name over several generations. To shout out the actor’s name is to recognize and reaffirm that they are faithfully carrying on the family tradition. You really need to be an expert to know when these shouts are appropriate however, so it’s best not to try this yourself! Stagecraft. Trapdoors and moving platforms are often used for dramatic exits and entrances. A revolving stage can be used for swift set changes. Sometimes the actors even fly above the audience on wires. Much of this stagecraft was devised before the age of electricity and originally relied on manual power. Color. From the beautiful costumes to the detailed props and gorgeous backdrops, kabuki is always a feast for the eyes. 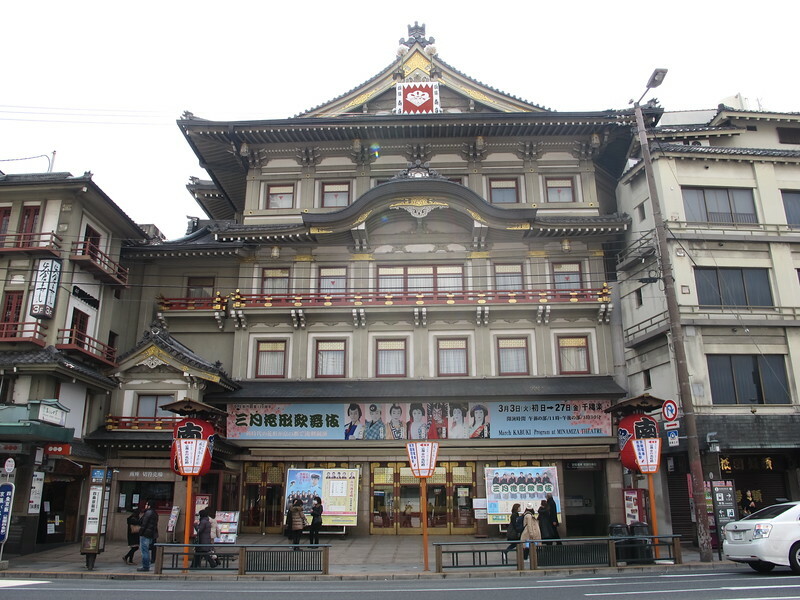 At the height of kabuki’s popularity, Kyoto had seven kabuki theaters, but only the Minamiza remains today. This magnificent theater is situated on the south side of Shijo-dori Street, just east of Kawabata street. The modern building dates from 1929, but a theater has stood at this spot since the 1600s, so it is quite rightly regarded as the birthplace of kabuki. These days the Minamiza hosts a variety of theatrical productions, but if there is a kabuki show on when you are in town you should definitely try to get tickets. 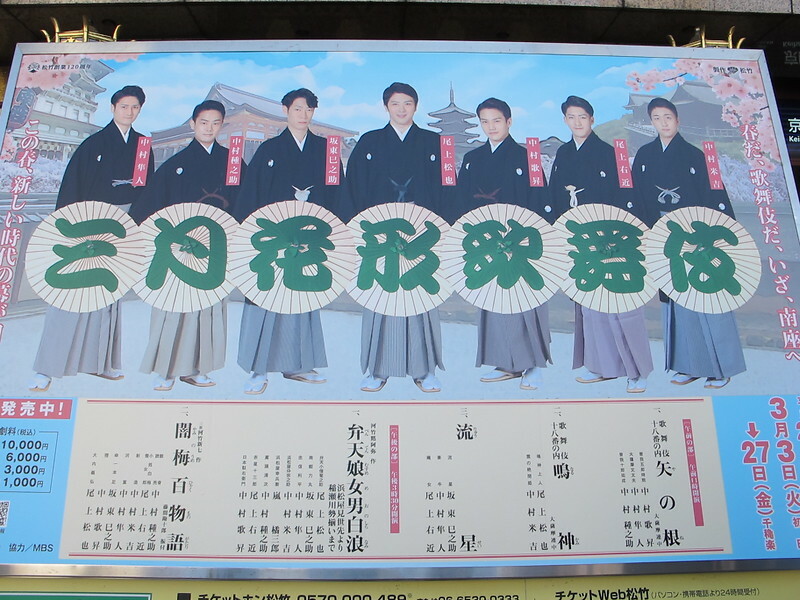 I went to see the spring kabuki performance which ran for most of the month of March. There were two different programs available for a matinee show and an afternoon show both lasting for approximately three hours. I chose the morning show, as it included three different stories (as opposed to two in the afternoon) and I thought it would give me a greater idea of kabuki’s diversity. Tickets ranged in price from 3,000 to 10,000 depending on the distance from the stage. I chose the cheapest seats which were up on the third floor, but the distance didn’t impair my enjoyment of the performance. To ensure that nobody is disturbed during the performance, the theater uses a rather clever device that jams people’s cell phone reception. Naturally you are not allowed to take pictures during the performance either. 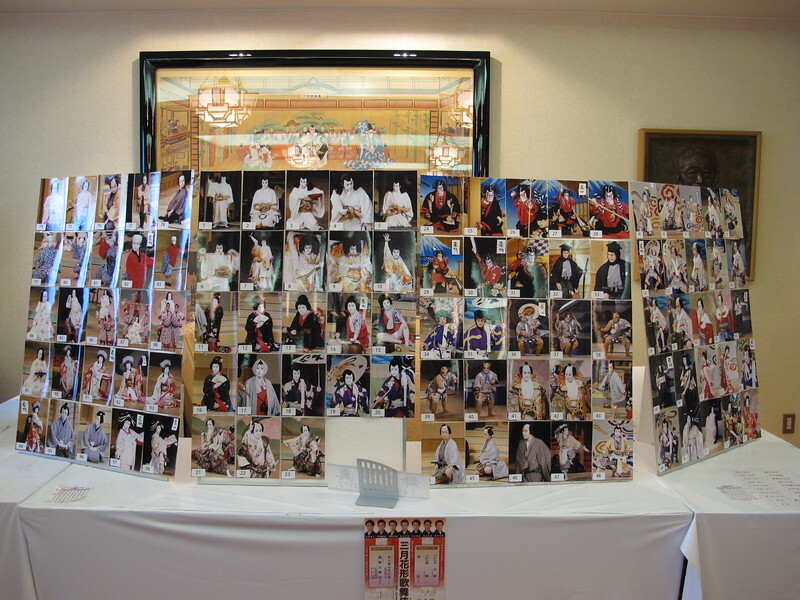 However, you can buy postcards with photographs of the show from a souvenir shop on the second floor. Be sure to get your souvenirs either before the show starts or during the intermissions, as the shop closes as soon as the show is over. Likewise there is a refreshment stand and sweet shop on the first floor that also closes after the last intermission. I saw three separate plays performed during a matinee performance at the Minamiza. The first was a bombastic tale of revenge entitled Ya no Ne (The Arrowhead). The second, Narukami (The Thunder God) was a comedic tale of a holy man who is seduced and deceived by a beautiful princess. The third, Ryusei (A Shooting Star), was a fantasy, in which an actor depicts a fight between a married couple by means of an elaborate dance. To give you just a taste of what you can expect from a kabuki show, let me tell you more about that first story: Ya no Ne. Ya no Ne is an episode from the Tale of the Soga Brothers which itself is based on a historical incident. Two brothers, Soga Juro and Soga Goro, grew up plotting revenge against Kudo Suketsune who had killed their father in 1176. They finally succeeded in assassinating their enemy, though tragically Juro was also killed in the attempt. In the episode Ya no Ne, it is New Year’s Day and Soga Goro is shown busily sharpening one of his enormous arrows and speaking of his need to avenge his father. Everything about Goro is huge, from the gigantic weapons that are arrayed about his house, to his outsized armour and clothes. Likewise in his speech and gestures everything is exaggerated so that he really appears super-human! This is an example of the “aragoto” or “rough style” of kabuki acting in which every action is dynamic and over-the-top. A friend visits Goro and gives him a new year’s gift of a scroll with a painting of a treasure ship. Goro’s friend tells him that if he sleeps with this lucky image beneath his pillow, whatever he dreams of will come true. The friend departs and Goro dutifully lies down for a nap. Sleeping, he dreams of his brother Juro, who glides in on a screened platform from stage left, and tells him that he has been captured by their arch enemy, Kudo Suketsune! Juro glides away, Goro wakes from his dream and realizing that it is true, leaps to his feet and prepares to go to the rescue. At this point, a white radish seller has the misfortune to enter the stage from the “hanamichi” walkway. He is leading a horse, the most realistic pantomime horse that I have ever seen, and Goro in his haste demands that the merchant give him the horse. Naturally the salesman refuses and a comedic tussle between the two ensues. When Goro has finally pushed the poor merchant away, he jumps upon the horse’s back, (the poor guys in the horse suit must be really strong!) and brandishing a giant white radish he rides triumphantly away on the hanamichi walkway to appreciative shouts from the audience. I really enjoyed my visit to the Minamiza. The gorgeous scenery, dramatic posturing, traditional music and elaborate stagecraft all helped to make it an unforgettable experience. It also really helped though, that I had looked up the stories I was going to see in advance of the show. I would encourage other first time visitors to do the same. I bought my tickets directly from the Minamiza box office but you can book them online from Shochiku’s official Kabuki website. This site also has information in English about upcoming shows at the Minamiza and other theaters throughout Japan. Useful summaries of many Kabuki plays can be found at Kabuki21.com and also at Jeff Blair’s Kabuki Page. Invitation to Kabuki has a lot of background information on kabuki’s stagecraft and history. There are a lot of videos online but NHK’s Kabuki Kool series gives a good overview of the genre. You can watch the first episode on YouTube. Michael Lambe is the author of the Deep Kyoto blog and chief editor of the Deep Kyoto: Walks anthology. Text and original photographs are all by Michael Lambe.